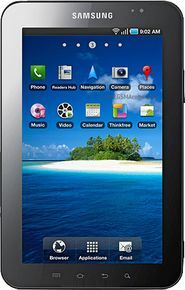 Samsung Galaxy Tab P1000 is currently not available in any stores. Watch your favourite video songs and movies in video player. It supports MP4, DivX, WMV, H.264, H.263 file types. The Samsung Galaxy Tab does exceptionally almost all the tasks its meant to do. But for the flawed gallery and the high-latency screen with sub-par viewing angles we are struggling to find an aspect of its performance to criticize. None of those are deal-breakers really. The Samsung P1000 Galaxy Tab is one pretty sleek device that suits its intended purpose perfectly. It's not running a proper desktop OS so those of you that hoped to throw away their laptops or netbooks after purchasing the Galaxy Tab are in no luck. tablets with these features are available between 4000-6000 (Karbonn is the best option to buy high end tabs at good price). 0 points in favour for 32,534 Rs tablet with these amazing features.